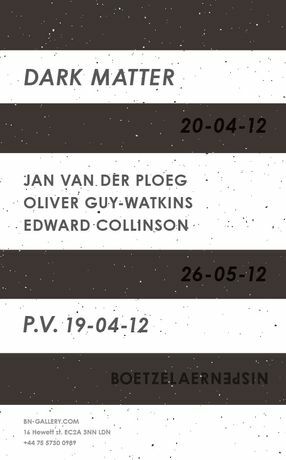 On the 19th of April Boetzelaer|Nispen will open a group show called: Dark Matter. 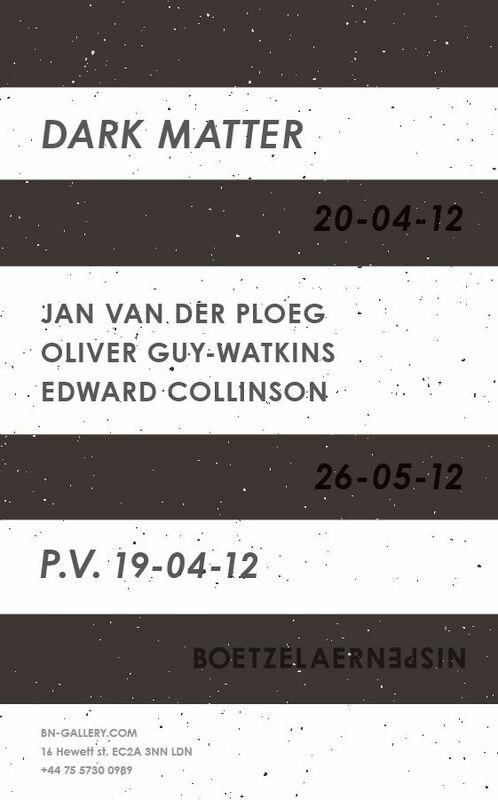 The show will feature the work of Jan van der Ploeg, Oliver Guy Watkins and Edward Collinson. To explain gravity and the expansion of the universe physicists have come up with the theory of Dark Matter. Supposedly it makes up 83% of our universe although not even the finest of instruments can see, touch, smell, taste or hear it. Dark Matter in the arts refers roughly to the same principle. It is the part of the artwork that's suggested but which is not there for the viewer to see. The three artists in Dark Matter all have their own methods of âsuggesting'. Jan van der Ploeg's work is best described in three words: colour, repetition and scale. His large scale murals appear to solve problems that the architecture of the exterior of a building or the space within poses. His murals also confront the flatness of the wall, sometimes by suggesting a relief, sometimes solely by changing the architecture with geometric fields of colour. In Dark Matter Van der Ploeg will apply a large mural on a large stretch of wall. He will also show several small scale works on canvas. Edward Collinson confronts the architecture of space as well. His large sculptures are born from a desire to change the space and let viewer experience this. As well as the altered experience of architecture in the sculptural works, Collinson uses material in a very overt manner, cramming it in to the works. The excess of mass and material Collinsons work might be an attempt to reveal a completeness/incompleteness in our material world. Oliver Guy Watkins chooses to treat the space like a stage, where his works function as the coulisses that suggest a surrounding. In his graduate exhibition at Central Saint Martins in 2011 he transformed a room by staging it to look like a cavernous space with ice on every surface. In Dark Matter Guy-Watkins will install a similar work that stages the effect of a frozen burst water pipe. By doing so he suggest and event that did not happen, preserved by circumstances that are not present in the gallery. Guy-Watkins will also produce an edition for Dark Matter.